I was happy to go through the monograph entitled 'Nadi Vijnana' written by Prof. S.D. Upadhyaya accepted for publication by chaukhamba Sanskrit Pratishthan. 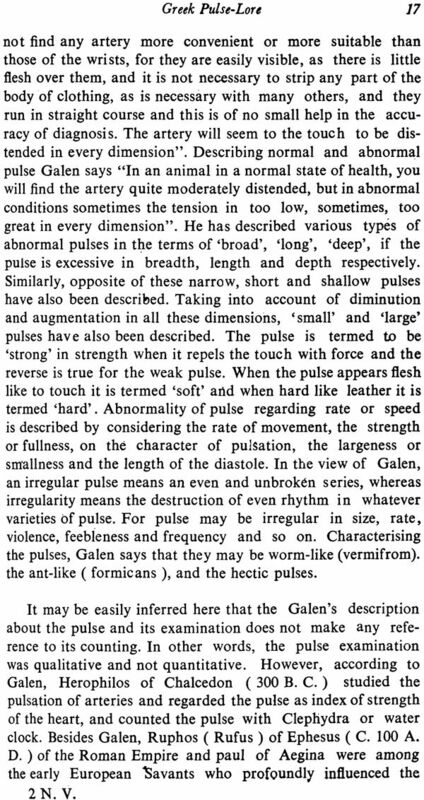 This monograph presents an interesting and informative scientific writeup on the very important topic of pulse science. Nadi Vijnana is an ancient science of pulse reading practiced with great expertise in Medieval India. 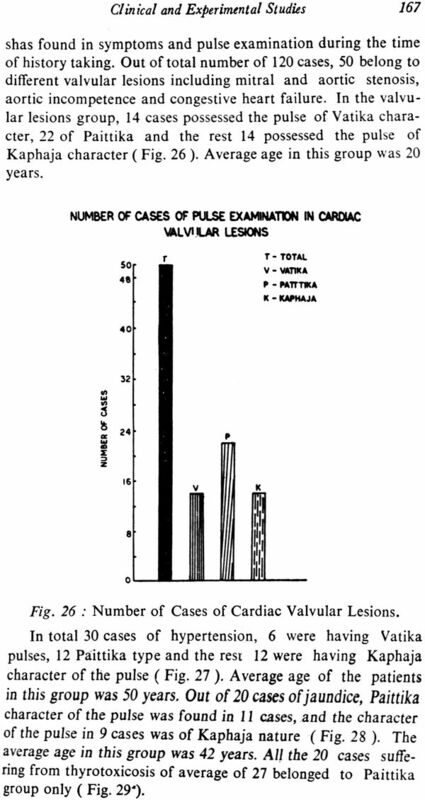 Though pulse reading was not given that much significance in Classical Ayurvedic physicians developed remarkable acumen and expertise in pulse reading for diagnostic purposes. 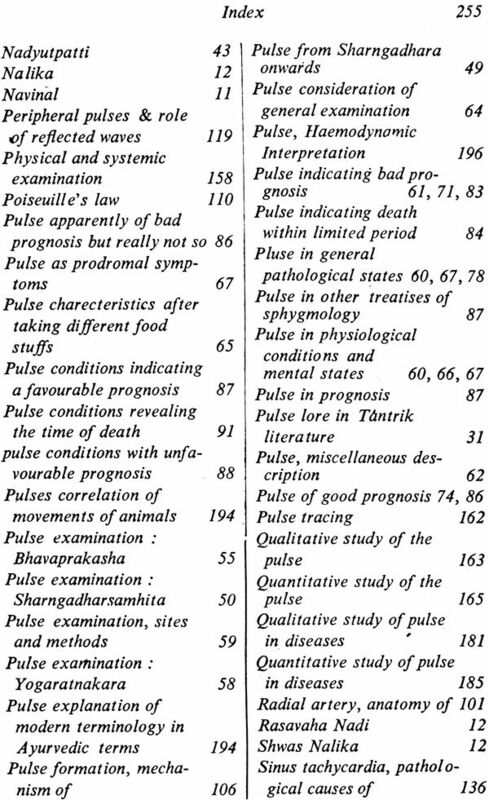 Pulse reading appears to have been more popular among Unani practitioners. In contemporary times there has been a gradual decline in the use of pulse reading in clinical practice and a need has been felt to revive this ancient art. Prof. Upadhyaya has done a commendable work in producing this monograph. This timely publication is a praiseworthy attempt. This monograph contains an account of the historical perspectives of pulse science. It deals with the knowledge on art and science of pulse science. It deals with the knowledge on art and science of pulse reading in different systems of medicine. The author appears to have devoted lot of time and energy in preparing the review on the chosen topic. The monograph also contains the observations made by the author himself in a series of patients and normal volunteers selected from the S.S. Hospital, Banaras Hindu University during the period when Dr. Upadhyaya was a research scholar. As a matter of fact the present monograph is an abridged form of the Ph. D. thesis of Dr. Upadhyaya submitted to the Banaras Hindu University for the award of Ph. D. degree in Ayuuveda Kayachikitsa. 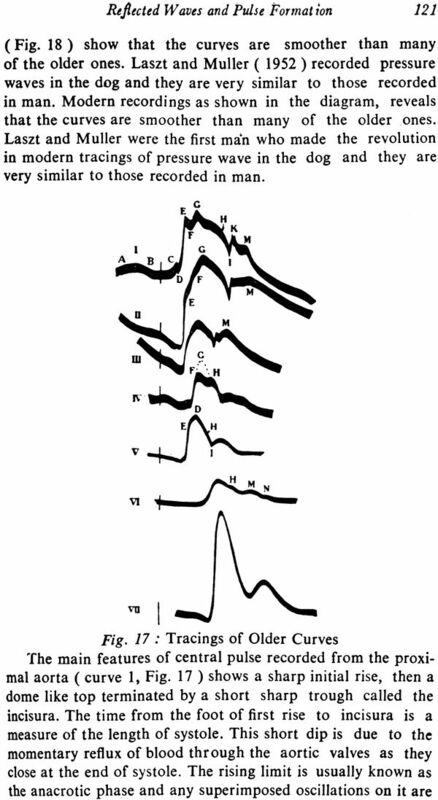 Using a Dudgeon's sphygmograph Dr. Upadhyaya has recorded the pulse tracings of a large number of subjects and has attempted to identify the pattern of pulse characteristic of Vatika, Paittika and Kaphaja types. Such a study will definitely prove useful in developing practical guidelines for pulse reading in clinical practice. 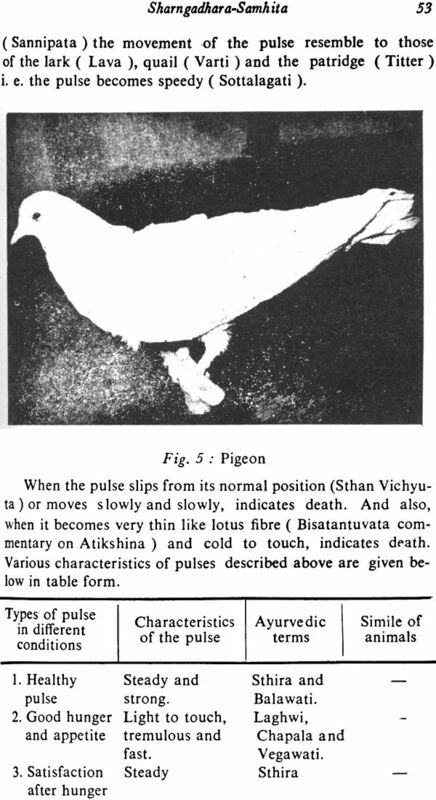 Though the study contained in this monograph is of a preliminary in nature, it gives enough lead of future work and opens newer vistas for research on ancient pulse science. Prof. Upadhyaya is one of the noted alumni of Banaras Hindu University. He graduated from this University in early seven tees and subsequently obtained his M. D. and Ph. D. degree form the Department of Kayachiktsa of this University. He is personally known with the reviewer for several years. He is personally known with the reviewer for several years. He is a popular clinician, a keen researcher and a successful teacher. The present work is definitely an outcome of his scholarship and enthusiasm to work for the advancement of Ayurveda. I am happy to write preface for this important work and wish all the best to this publication and the author. It gives me great pleasure in writing the foreword to this monograph complied by Dr. S.D. Upadhyay. This monograph on Nadi-Vijnan incorporates all about the rare and valuable treasure of scattered knowledge of ancient pulse lore of different civilizations of the world. 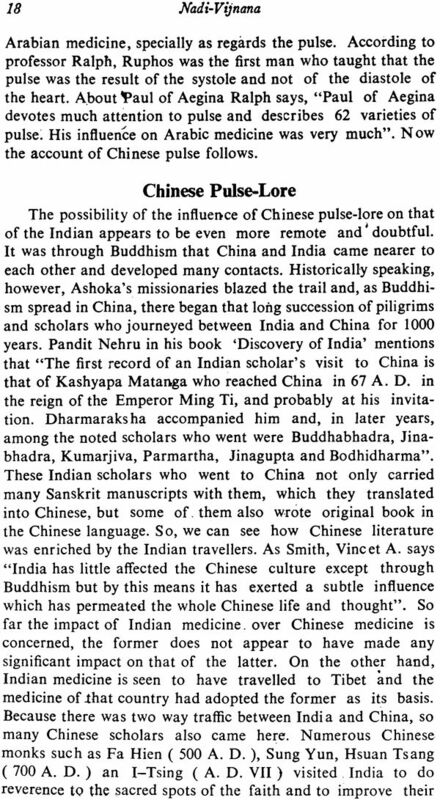 This is particularly so of the Indian pulse lore which has so far been untouched in its own framework on scientific footings. The present endeavor is a first attempt in that direction. It is claimed that the knowledge of pulse science originated some thousand years ago in various medical disciplines of the world, like Greek, Chinese etc., and it was recognized as a major tool for arriving at diagnosis. But in India, as evidenced, it perhaps saw its first dawn in its original form in the work of Sharngadhara compiled sometime in 14th century A.D. which is a historical landmark in the development of Ayurveda. 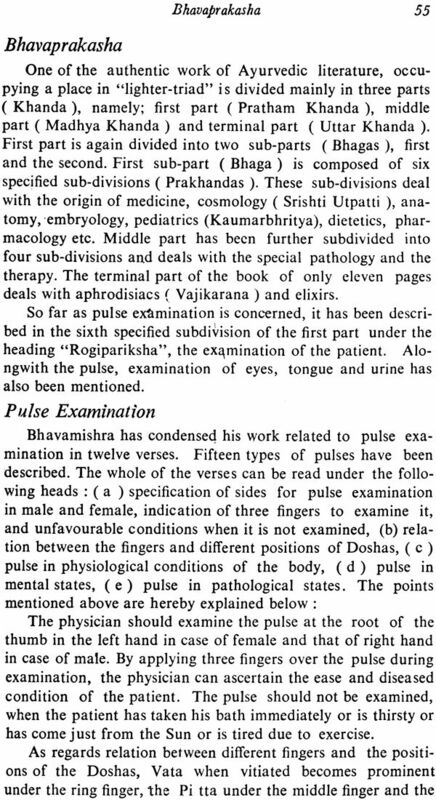 As regards the earlier classics of Ayurveda like, Charaka, Sushruta and Vagbhata and the other treatises such as the Bhel Samhita and Hareet Samhita the authors were quite silent in the topic excepting with the citation by charaka in the Indriyasthana that cessation of pulsation of ever pulsationg Manya the carotid artery, is the indicative of death. Thus by making a thorough search of the entire literature of Ayurveda available upto 14th century A.D., it can be inferred that for the first time it was Sharnagadhara who introduced the pulse science in Ayurveda. This knowledge constantly grew and flourished throughout the subsequently period in the history of the country. This science being practiced since then by the Vaidyas and the Hakeems of India has been preserved and handed down through tradition till today. In fact diagnosis by means of pulse is highly admired by the people of India even in this era of advanced science and technology. Varanasi, since time immemorial, has been a center of great Indian culture, particularly for Ayurveda. In this holy city, late Kaviraj Pandit Satyanarayan Shastri, the great Ayurvedic physician had been pioneer in the field of pulse diagnosis for which he will be remembered with high esteem among all the physicians of Ayurveda in the years to come. Perhaps it is the great Ayurvedic tradition of Varanasi that has inspired the author for the furtherance of this work form a new angle, the first of its own kind. Started his medical career in the college and in the Institute of Medical Sciences, Banaras Hindu University, Varanasi, the author is well known to me for more than a decade in various phases of his life as my student, research scholar and the clinical registrar in the department of Kayachikitsa of this institute. The author is among the few original thinkers of Ayurveda and is known for his insight into the subject. The author deserves every appreciation of this monumental work from many points of view. Firstly for his hard work and the great pain he has taken in collecting the various rare manuscripts specially from the Tantrik and the folk-lore literature. Secondly, the framing of the experimental work for recording the Waves of Vatika, Paittika and Kaphaja pulses and their analysis in the modern line. And thirdly the inclusion of newer idea of frequency analysis to enhance the quality of research to analysis even the slightest shades of Vata, Pitta and Kapha in a single pulse wave. This specific work will enrich the knowledge of Ayurveda in general and to the knowledge of pulse diagnosis in particular. I am very hopeful that this scientific contribution to the traditional method of pulse diagnosis would serve as a means to serve the suffering humanity in the diagnosis of the diseases in a more simpler and analytical way. I congratulate the author and wish him all the best for this important publication. This monograph entitled Nadi-Vinana (Sphygmology) is a humble attempt to re-establish the principles and practice of Nadiparikshna on universal basis. Varanasi has always attracted patients to seek the diagnosis and treatment based on Nadipariksha. The national and international reputation of pandit Satya Narayan Shastri as an expert in Nadi Pariksha diagnosis was too well known for repetition here. The patients who visit Ayurvedic physicians for treatment are still inclined to be diagnosed by Nadi Pariksha. Systematic and comprehensive training of Nadi Pariksha in Ayurvedic colleges could not be standardized due to lack of data based on scientific research. Thus it was thought necessary to plan and conduct research on Nadi Pariksha so that an acceptable model may be constructed for universal application. 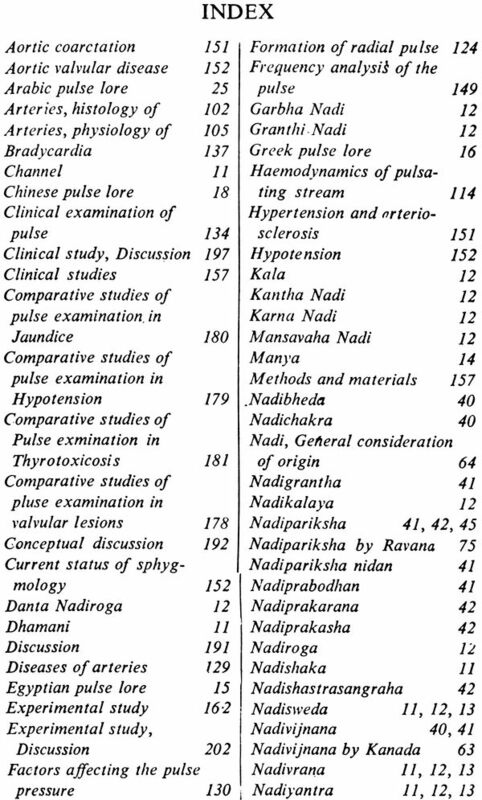 It is hoped that the work presented in this monograph will pave the way and stimulate systematic and scientific studies on pulse examination a hitherto a less cares area for research in Ayurveda. A brief account of the current status of Nadi Pariksha in various systems of medicine is presented herewith. There is in clinical medicine no physical sing more basic or important than the arterial pulse. From ancient times the pulse has been recognized as the most fundamental sign of life. The early physicians paid great attention to the character of the pulse health and the changes which occurred in disease. 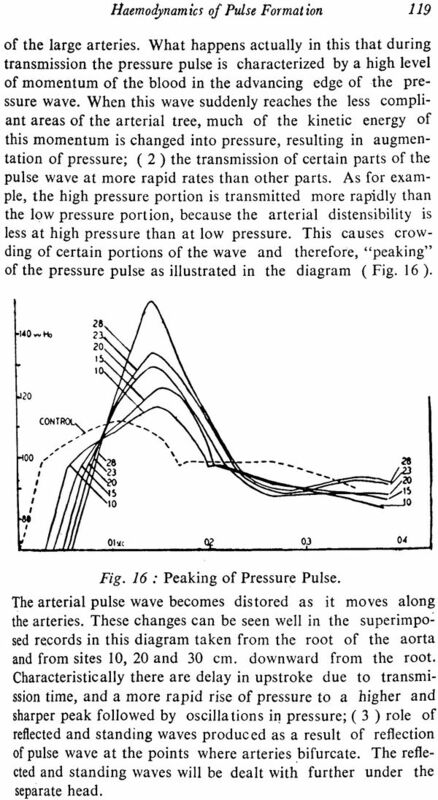 Even to-day under emergency clinical conditions the modern physician frequently records the pulse directly through an intra-arterial catheter, and he wishes to gain as much information as possible from inspection of pulse contour. To the modern physician, of course, the study of pulse has got its limited scope in studying the diseases of heart and arteries. To the ancient physician, irrespective of civilizations of the world, the pulse has always been the subject of great learning in the field of medicine. Perhaps Egypt (B.C. 1550) had been the earliest country of the world which invented the knowledge of pulse only to know the physiological condition of the heart. And from there the rays of knowledge of the same spread all Greek system of medicine had written several treatises on pulse examination. As regards Chinese system of medicine, it has wealth of treatises on the pulse. 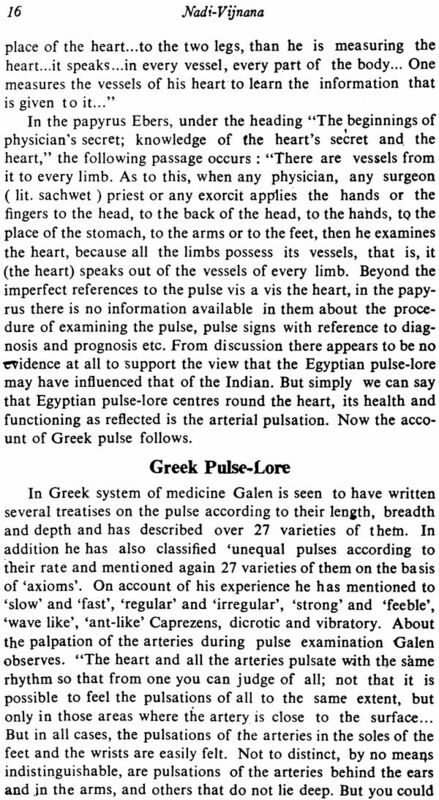 The Arabic system of pulse-lore is totally basad upon the Greek system of medicine And that is why it is known as Greeko-Arabic system of medicine. A great knower of this system of medicine, Avicenna (A. D. 980) had been the physician of repute who by his own experience furthered the knowledge of pulse examination. 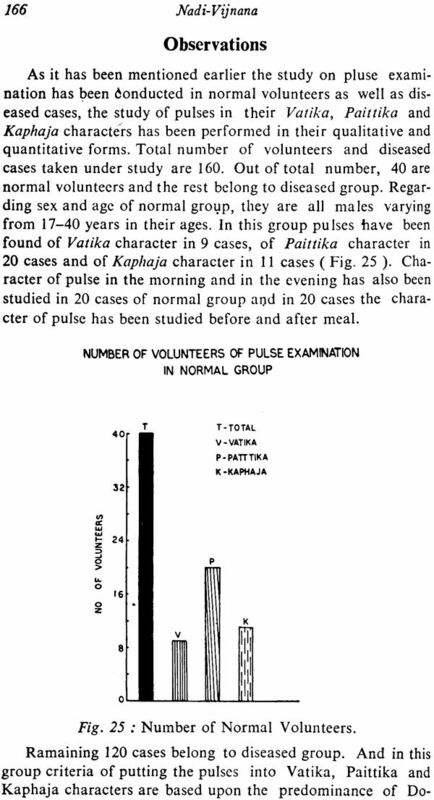 Though in India the knowledge of pulse examination was not prevalent as a means of diagnosis till as late as the period of Sharngadhara, yet some ancient races of India as Santhalas and Tantriks of India were aware of this knowledge. In Ayurveda, from the period of Sharngadhara onward the knowledge has constantly been added up. Still we find man separare books written on sphygmology and available in various private as well as government libraries of India. In some of the treatise along with the pulse examination, Tantrik source of Nadi is also cited there. After going through the various literatures of sphygmology of different civilizations of the world and seeing the recent contribution of modern haemodynamics in this field, the present study on Nadi Pariksha has been chosen. No prior standard scientific work was available on Nadi Pariksha, therefore, I have limited the scope of study only to the qualitative and quantitative standardization of Vatika, Paittika and Kaphaja pulses in this monograph. 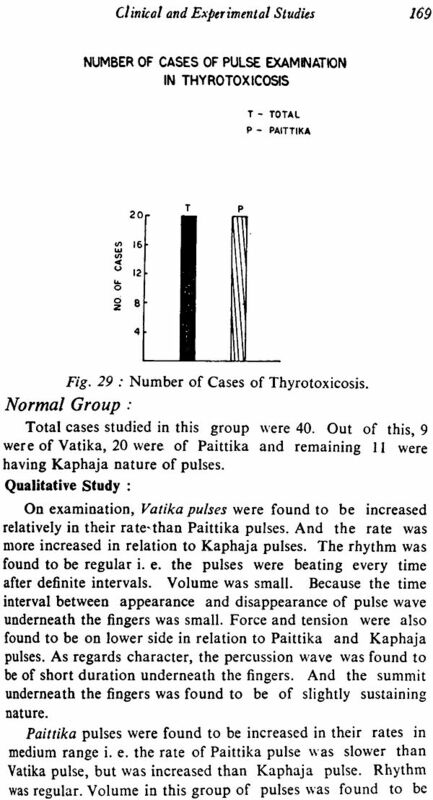 Besides clinical study of Vatika, Paittika and Kaphaja pulses in terms of rate, rhythm, volume and character etc. pulses have been studied in their graphic forms, particularly to standardize them qualitatively and quantitatively. As regards studies in giving the practical forms to Vatika, Paittika and Kaphaja pulses, a practical hypothesis has been proposed so that this may have applied form also. The Vatika pulse possesses smallest percussion wave with its conical summit, rudimentary or no dicrotic notch, highest pulse rate and lowest pulse pressure in relation to Paittika and Kaphaja pulses. Paittika pulse has longest percussion wave with its sharp conical summit, marked dicrotism and highest pulse pressure. Kaphaja records medium percussion wave with well sustained rounded summit, gradual and steady fall of dicrotic wave with small dicrotic notch. 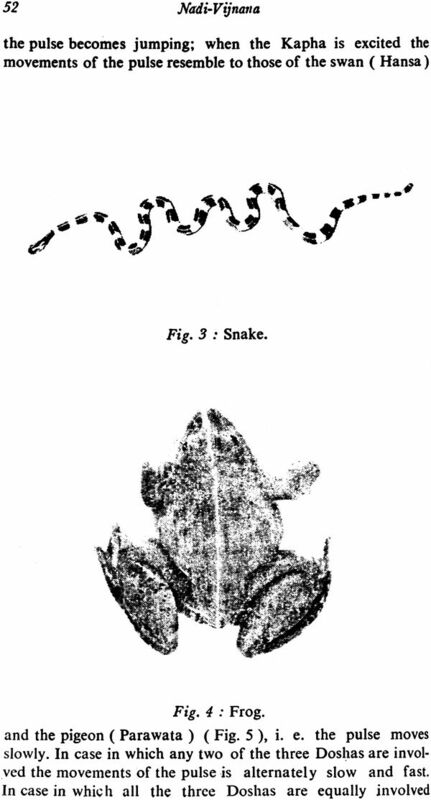 This monograph consists of seven parts and eight chapters. Part one has been divided into two chapters. The first chapter deals with the use of term ‘Nadi’ in various denotations except the pulse examination in ancient treatises of Ayurveda, i. e. from 600 B.C. to 1200 A.D. In chapter second and account of Nadi Vijnana prevalent as a means of diagnosis in different systems of medicine as Egyptian, Greek, Chinese, Arabic and Tantrik literature has been given. 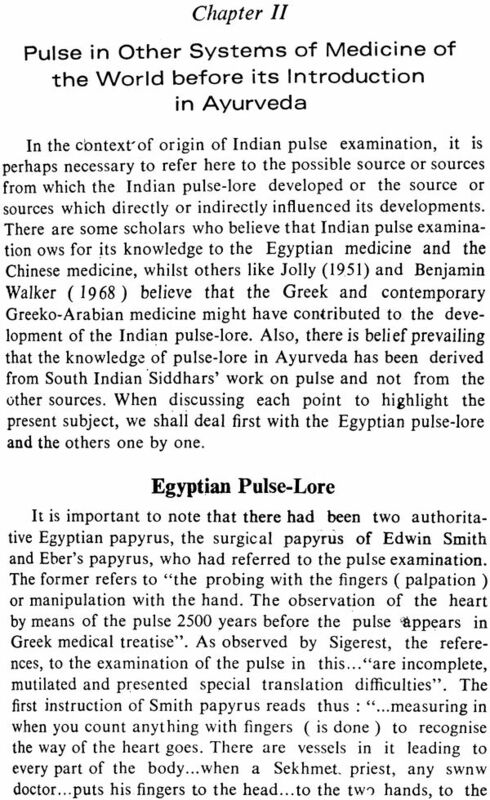 In concluding portion of this chapter it has been shown that Indian physicians of the time derived their conceptual knowledge of pulse from preva-time derived their conceptual knowledge of pulse from preva-lent Indian Tantrik pulse-lore, whereas they shaped the practical aspect of pulse examination along with the contemporary Hakims of Greeko-Arabic system of medicine of the time. Part Two: Ayurvedic Review: Applied Literature. 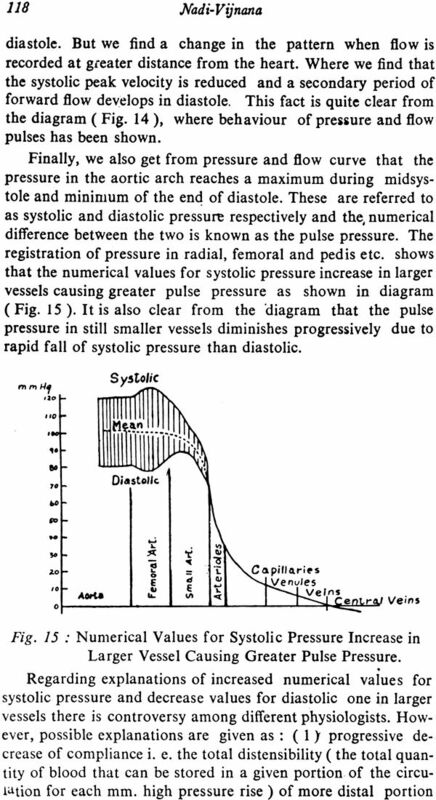 Chapter IV: Pulse in other treatises of sphygmology. Part Three: Modern Review of Literature. Chapter V: Anatomy and histology of radial artery. 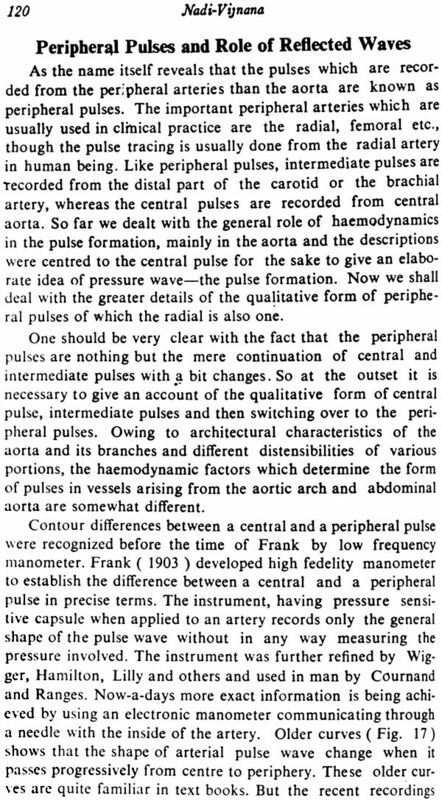 Chapter VI: Physiology of arteries and mechanism of pulse formation.